We all know, that Indra Jatra is one big festival and what separates this festival from others is the craziness of its own. We have seen ever unique “Lakhay” dancing on to the beat of the drums and “Pulu Kisi” as wild as it gets on the road and not to forget all the three living Goddess Kumari, Ganesh and Bhairav. 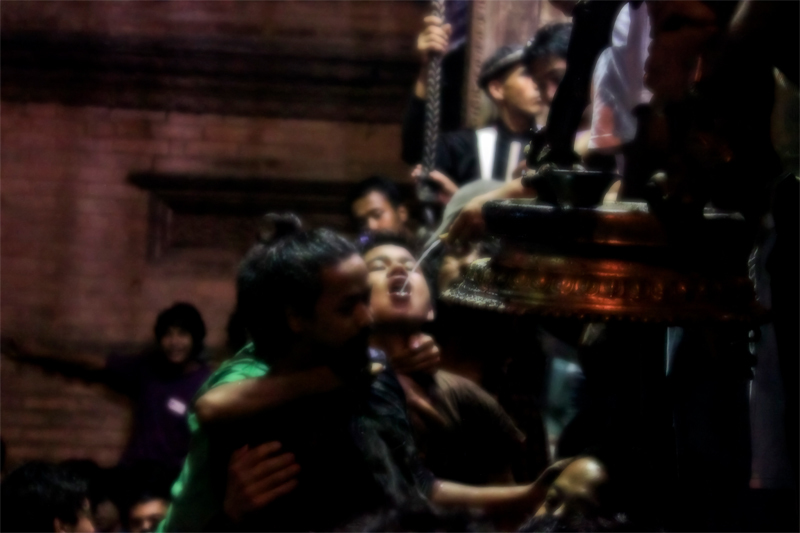 This picture was taken at Hanuman Dhokha, where devotees taking liquor as prasad blessings from Swet Bhairav on the last day of indra Jatra.Yes we all know that “Prasad” is just a reason, but where in the world would you get to see this. As one can see in the picture that people were pushing each other to get the taste of “Prasad” and for those who got it were the lucky ones, must say its a consolation to mark the end of the great festival Indra Jatra.